Washington Monthly | Will Higher Education Reform Become Another Ideological War Zone? Will Higher Education Reform Become Another Ideological War Zone? Conservative outlets like Fox News have been running wall-to-wall stories about PC-related incidents on college campuses, such as left-wing student protesters shutting down speaking appearances by Ann Coulter and the like. Back in the spring, with the Trump White House in disarray and the GOP-controlled Congress unable to make headway on repealing Obamacare (or do much of anything else), conservative media outlets like Fox News were struggling to keep audiences engaged. So they hit on the strategy of minimizing D.C. coverage and instead running wall-to-wall stories about PC-related incidents on college campuses, such as left-wing student protesters shutting down speaking appearances by Ann Coulter and the like. That strategy not only helped shore up the conservative media’s flagging ratings; it also proved once again its power to shape base Republican opinion. A June Pew Research Center poll found that 58 percent of Republicans and GOP-leaning independents think universities have a negative effect on the country, up from 45 percent a year earlier. No change was detected among Democratic and Democratic-leaning voters. That big asymmetrical shift is a danger sign. For years, higher education policy has been what you might call “pre-ideological.” That is, the two parties haven’t had fixed, irreconcilable differences on the subject. Everyone knows that Republicans and Democrats line up on opposite sides of issues like tax cuts for the wealthy and government-funded health coverage. But on most higher education issues—say, federal grants for academic research—there’s long been rough bipartisan consensus. Democrats may be stronger supporters of expanding Pell Grants, and Republicans more resistant to regulations on for-profit colleges. But even on these issues, individual lawmakers occasionally cross party lines. This ideological fluidity is one of the reasons we at the Washington Monthly look forward to putting together our annual College Guide, as we have for more than a decade. Though a magazine of the left, we know that on this issue, at least, we’re not talking just to our own side. The Bush and Obama administrations were both open to our arguments for more disclosure of federal data on individual colleges’ costs and student outcomes. And the metrics we use to rate schools—recruiting and graduating students of modest means, creating the ideas and technologies that fuel economic growth, and encouraging students to serve their country and communities—defy ideological labels. Rather, they sum up what most Americans should expect colleges to deliver in return for $160 billion in annual federal subsidies for student aid. 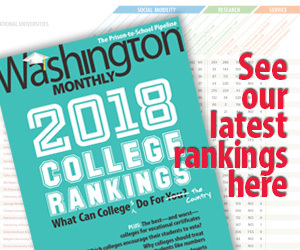 If there is a bias in our rankings, it’s in favor of schools that do an exceptional job educating the average college student at a reasonable price and against the elite schools that dominate the U.S. News & World Report rankings by catering to the 1 percent. But that’s a bias that, as a general matter, a growing number of Americans in both parties share. On higher ed, we were populists before it was cool. But conservative media are ginning up a very different kind of populism. It’s one that portrays the entire higher ed sector as a leftist threat to freedom. And it dovetails with another backlash among non-college-educated whites—the group that put Donald Trump in office—against the value of higher education itself. A poll this summer sponsored by the Democratic-leaning House Majority PAC found that 57 percent of such voters believe that a college degree would saddle them with more debt without helping them get a good-paying job. Other demographic groups, including working-class minorities, do not share this same level of skepticism toward the value of college. “I love the poorly educated,” Donald Trump famously said on the campaign trail. As president, he hasn’t done much yet to exploit the emerging rifts in attitudes toward higher education—though recent reports that his Justice Department plans to investigate college affirmative action programs may signal a first step. Even if he goes in that direction, I’m guessing that higher education policy won’t become just another ideological war zone anytime soon. First, Trump has burned congressional Republicans enough by now that they may not support another populist crusade that runs counter to the interests of business, which wants educated workers. Second, Democrats seem to have gotten wise to the danger. Conspicuously absent from congressional Democrats’ “Better Deal” economic plan, designed to broaden support among working-class white voters, is Bernie Sanders’s “free college” idea. In its place is a proposal for a tax credit to employers to hire and train new workers either on the job or via community colleges. That’s a good move, on political and policy grounds. Not every American needs or wants a BA, but some form of postsecondary training and credential is fast becoming a universal necessity. A third reason higher ed might remain pre-ideological is that many of the best ideas for reforming the sector really are bipartisan—from taking on swollen Ivy League endowments (see Anne Kim, “Ivy League Endowments Under Fire”) to improving education for adult learners (“America’s Best Colleges for Adult Learners” and Joshua Alvarez, “The Twelve Most Innovative Colleges for Adult Learners”). Lawmakers who care about these areas aren’t going to want to sacrifice the possibility of shaping good policy just so Trump and Fox News can have a little more red meat to feed their followers.